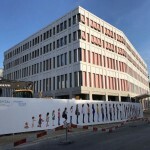 June 2018 – In an inauguration ceremony Inselspital Bern opened a new 8-storey building which will accommodate the future Organ & Tumor Center. The building is the first building to be completed as part of the masterplan for ther period until 2025. The building will now first house the gynecological clinic and the neonatology department and will later become the new organ and tumor center of the Inselspital. MMI created the medical concept and the feasibility study for the hospital building. In addition MMI´s experts developed the operational concept as well as different relocation scenarios. Named after the Bern surgeon and Nobel Prize winner Theodor Kocher, the building contains a total of 51 treatment rooms, 4 operating theaters and 5 delivery rooms. A new University Hospital park was opened simultaneously with the inauguration of the building. The recreation area is intended to enhance the large hospital complex with attractive retreat areas for patients, employees and visitors.